To continue with today's fight against the cold, I opted for a thick Cos roll neck jumper, Reiss pea coat, Gap jeans and Clarks boots. My Boden leopard print satchel gave the outfit a bit of focus and as I spent a large part of the day shopping with our eldest, it also meant that I had both hands free to assist her (OK, to carry the bags)! On a different note, I've been mulling something over for a while now which is this: the way that brands attribute people's names to their clothes, is pretty cunning. If I see something - such as the jeans in Whistles, or the shoes in Clarks, both called Matilda - or something with the name Florence, Flo, Floss or Flossie, Lexie, Libby, Ellen, Ellie, Poppy, Ruby, Lottie, Emily, Emilia and so on (I've chosen these names in particular because I have seen all of them used in this way) I am more positively pre-disposed to the said item than if it wasn't given the name of someone that I know. It's not so much that I would go "Oooh yes, I know a person with that name so I must buy said item" so that I end up wearing a random selection of clothes (well, I may end up wearing a random selection of clothes but that would be for a different reason) but I may look on it more favourably and I will almost certainly remember it - which could translate into a sale further down the line. So whoever thought of it, it works, just in the same way that naming coke cans did because yes, I was one of those people who hunted high and low to find a can with a specific name on it (only to be beaten to it by the then five year old). On reflection I don't know whether that makes the marketing departments cunning, or me just gullible and a softie! The beauty of an uber big coat on a very cold day - and how to train boys to look after handbags! We've had snow! It wasn't a huge amount and it hasn't settled but needless to say it was really, really cold here today. My friend and I ran for nearly two hours in it and despite wearing three layers, two of which were pretty thick, it still wasn't that warm. After returning home, I showered and headed straight into town to do some work and some jeans research (more on that tomorrow hopefully) but I also went to town because I have found that, after a long run, it is better to keep moving. When it was time to do the school run, it was still freezing and I was grateful to have my Whistles parka. Luckily it is large enough to throw over any other jacket I may be wearing that day without making me feel squidged like a sausage in a skin . It wasn't something that I bore in mind when buying it but it's actually really handy to have a coat big enough to accommodate what you have on already, without having to take a layer off - which obviously totally defeats the object on a cold day. The pockets are great too and they mean that I can stuff everything in them whilst leaving my handbag at home. Today however I didn't have time to decant everything into my pockets. When the car is full, as it was today, there isn't space for my bag to have its own seat so I had a dilemma. Abandon a child so that the bag can have a seat or ask a 12 year old boy to sit with my bag on his knee? I took the latter option. I did feel slightly bad for my son's friend but then I figured that it was good training for later in life - and quite possibly better than abandoning him at the railway station or making him sit on the roof. Handbags deserve respect! I do feel though, that I ought to mention it to his Mum, just in case she wonders from where he has gained his newly acquired knowledge of (semi) designer handbags! In addition to the Whistles Parka I was wearing the Whistles Annabel jacket and Whistles jeans, Topshop pale blue jumper and belt, Zara boots and Jigsaw necklace. There's going to be a lot of denim around this season, so get ready girls and dig out those denim jackets. Hmmm. Maybe. But then again maybe not. Denim dresses, however, have caught my eye of late, which has got me thinking about them. Specifically I have a friend who loves clothes but who never wears dresses as she feels too dressed up. So, I thought, a denim dress could be a good place to start. It's just a dress version of jeans really which makes it simple to get your head around. I prefer the shirt dress styles rather than the prom style (too teenage) and even within a shirt dress there's a shape for everyone. Either belted or not, V-neck or buttoned up, short or long, fitted or loose - it's just a question of finding the right one and most have sleeves, which is an added bonus. I like the simple back drop that denim dresses provide for a statement necklace, a big printed scarf or a change of belt. They can be layered up with a polo neck and thick tights and boots for now and then in the warmer months they can be swapped for converse/flat sandals/wedges or even, dare I say it, Birkenstocks! 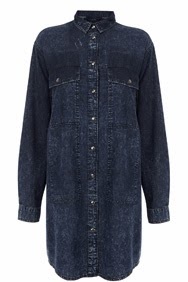 The Next denim shirt dress (£30) is one that I haven't yet seen in the flesh but I have quite high hopes for it. More importantly it comes in tall and petite too. I like how the belt could be swapped on this one for something bright, studded or Perspex. 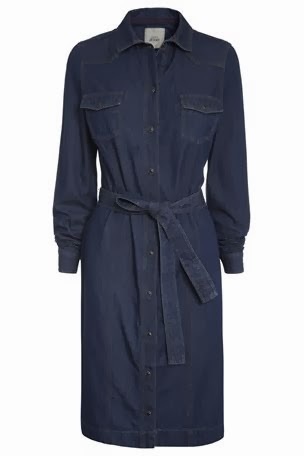 I saw this Warehouse denim shirt dress (£60) yesterday and really liked it, although I felt that at £60, it was a bit spendy. The v-neckline is good though for those with a curvier bust and the waist tie gives it some shape. The zip detail is great for drawing attention to your shoulders - if that's the kind of thing you are happy to do. This oversized shirt dress, also from Warehouse is a different style completely. Looser and buttoned up to the neck, it just offers a different feel. 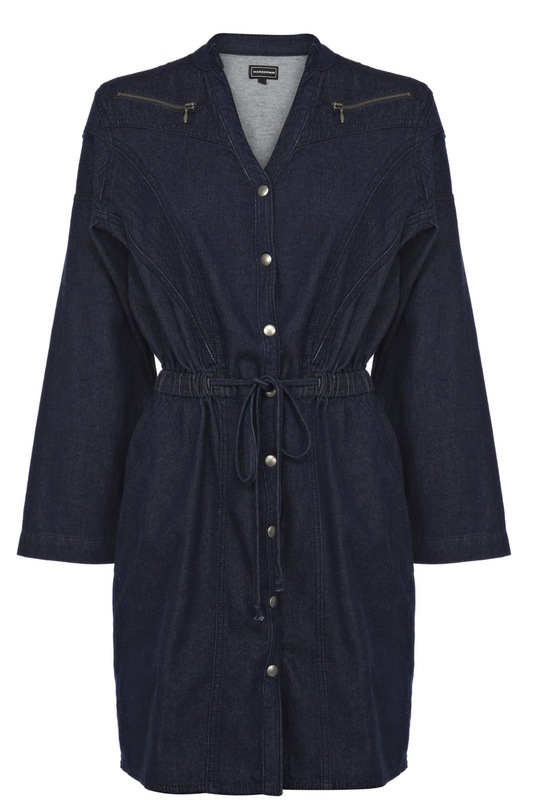 The image of this Levi's denim dress, (reduced to £62.90 from £90 in the sale) isn't great but it's worth taking a closer look at it via the link. The neckline is pretty and the belt could also be swapped on this one. The length is also quite good on it too, so no-one need flash their pants when bending over to pick up the baby/put the washing machine on and so on. What I would like to know is this: How is it possible to start the day thinking that your wardrobe is fine but end it with a list as long as your arm of pieces that you've identified that it is impossible to live without? But on reflection, I see this as a good thing. This morning I was slightly wondering where my fashion mojo had gone. 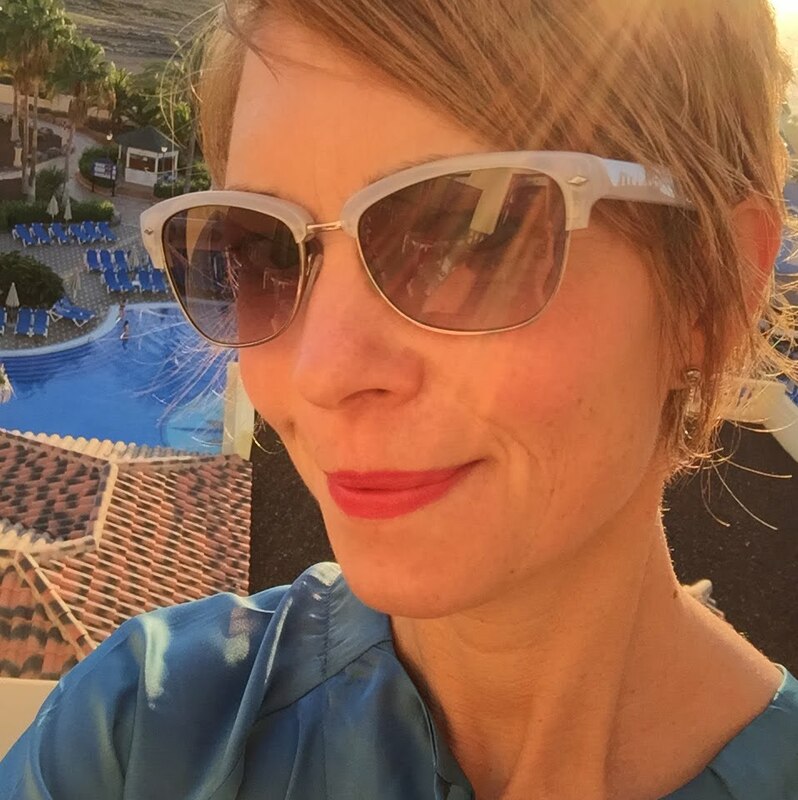 Rarely do I wake up and not think about what I would like to look at online, or add into my wardrobe, or investigate further in the shops - and that's what makes my day a happy one - just in the same way that some people look forward to a glass of wine in the evening, or think about where to go on holiday. It's what I spend my time musing about as I go through my day - an antidote to the sometimes sadder things with which we have to deal. But today it wasn't happening. So, where's this all going? That, I must admit, I'm not sure - but I think that it's somewhere along the lines of this: although it's important to count your blessings, a little day dreaming and coveting is one of life's guilty pleasures and it's good for the soul (I think). Fugly shoes - will you or won't you? When I was at law school, my friend and I shared a house with four lads. They were very funny and, being typically laddish, had several phrases to which they introduced us. On one of our frequent trips to the pub, they introduced us to the phrase " Fugly" - as in - "Blimey, that girl over there, she's REALLY fugly." For those not familiar with the phrase, I'll say no more, but let's just say that it's not a compliment. 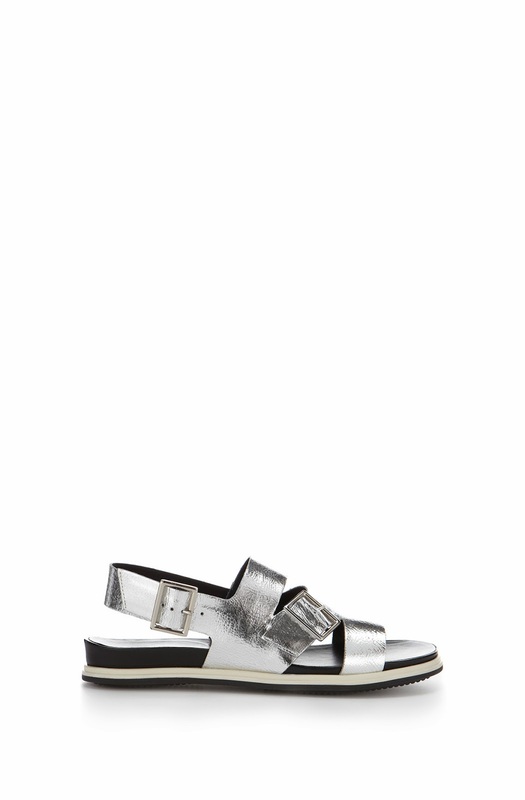 Whistles, who has this pair for £220. I'm trying to be open minded - really I am. 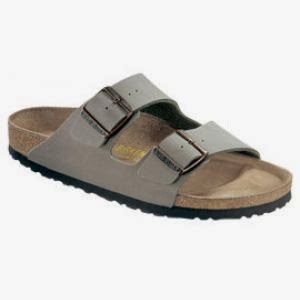 Then of course there are the faithful old Birkenstock £44.95 which I'm sure many of us own already and which, I'm fairly sure, many of us thought had had their last hurrah! I could make out that I'm way ahead of the fashion curve and say how many pairs I own and for how long I've owned them. But I have concluded that that doesn't make anyone - least of all me - sound ahead of the fashion curve. No, it just makes me sound old. Unsurprisingly, Zara are getting in on the act with this Rose Gold pair, which aren't yet available on-line. Much as I hate to say it, I will be investigating these more closely when they arrive in store. They do have some kind of appeal, which may translate in real life - although I'm prepared to accept that it may not. 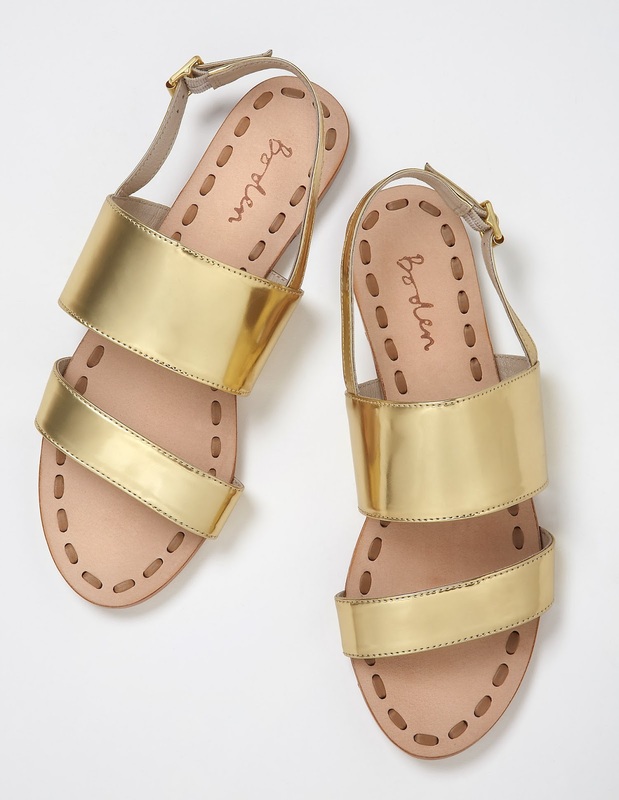 And even Boden have their own interpretation, with the Serrana sandal, so maybe they are becoming more mainstream after all. For once fashion has produced something that, despite its inherent bad looks, is both comfortable, practical and affordable. This means that, whilst it shouldn't automatically be jumped upon like the latest designer range for H&M, it shouldn't just be written off as a "no-go". There may be a place for them in my life. In fact if they're comfortable, there may be a huge gaping hole for them in my life, which leaves me very slightly concerned. The metallic versions make them slightly more attractive, so they may be worth investigating and some styles (I think I'll leave the plastic and furry ones out of this) worn in the right way and with the right things, could really breathe life back into things that have been lurking at the back of the summer wardrobe for too long. The slightly chunky versions can also have a slimming effect on the leg, so that's worth considering too - though Birkenstocks can create cankles where there are none! On the whole, whilst I wouldn't like to say that I'm there just yet, I do have an open mind on them but I may skip this particular look altogether, being fearful that, just as in the case of Uggs, if ever I put a pair on, I wouldn't want to take them off again and that, however you look at it, is not good. I realise that I am asking for trouble in posting a picture wearing no make-up, no tights and in a bathroom which clearly needs to be relieved of its collection of spotty onesies and rubber ducks - but I consider it as being all in a good cause. You see I bought this yellow print dress from Warehouse (£50) when I was out shopping for an event earlier in the week. 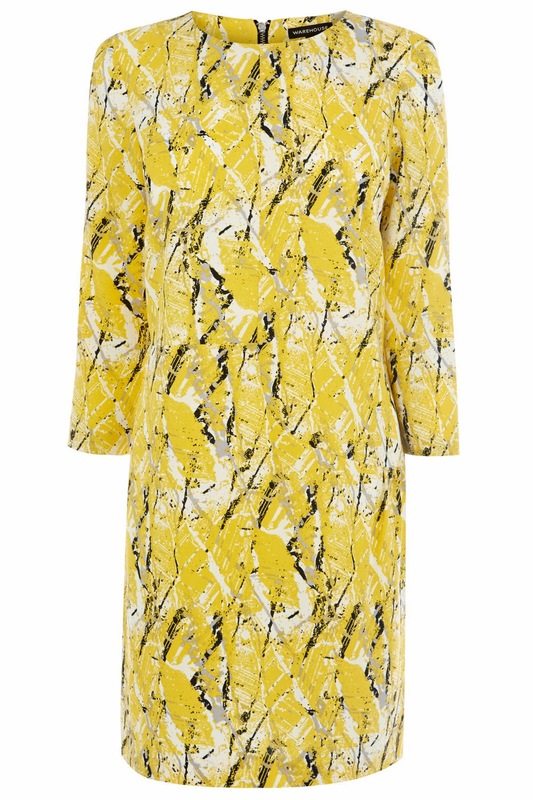 I really liked the print and the colour - not necessarily for me - but it just stood out as being, well, sunny - and it's always good to show dresses with sleeves. Then a friend asked me which dresses I had bought for the event and whether she could take a look, so the easiest thing was to stick it on, grab a pair of shoes, take a photo and whizz it over to her. Then I decided that it didn't look quite as bad as I'd thought it would, especially given the limitations of no make-up (all of which had been washed off whilst running in the rain) and no tights, so I decided to share it with you after all - just in case someone, somewhere, happened to be looking for an emergency dress purchase. I'm not saying that I would actually wear it like this - I just don't mind (too much) being seen looking like this. It's hard to see but there is some detailing on the hip so do take a closer look via the link if you like the look of it. Warehouse has a good selection of printed dresses in at the moment. As you know, I prefer to see, or try, things for myself before sharing them with you but I haven't been able to do that with all of the below. Having said that, I'm always fairly confident with the Warehouse dresses in terms of cost/fit/quality so I'm happy to suggest these to you. I never forget that prints are a very individual thing so you may think "yuck" to some of them and "yum" to others. There's never really a one size fits all when it comes to prints, so it's more a case of taking what you like and leaving what you don't. 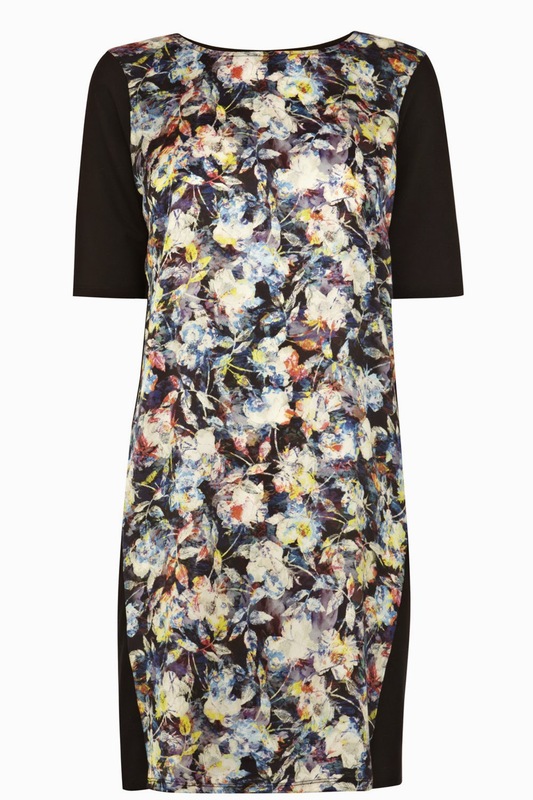 The fit of this graphic floral dress Warehouse (£38) is actually less bodycon in real life than it might suggest at a first glance. The black sleeves and panelling at the hem stop it from being too pretty pretty. A sleeve is always a good option in a dress, both from a coverage and warmth perspective and there are plenty of colours to work with in this floral tunic dress Warehouse (£40). I would try play up the pink or the yellow in accessories, rather than the obvious navy or black. 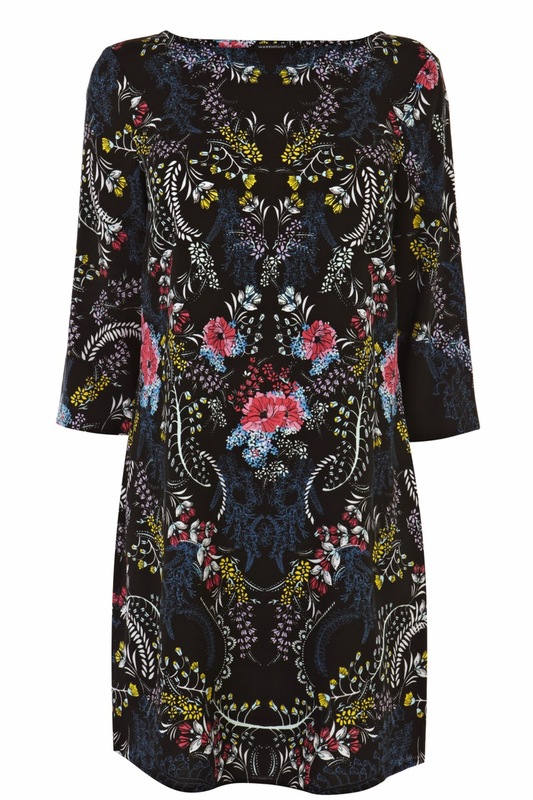 For those who prefer a little more by way of shape at the waist, this floral dress Warehouse (£45) could be a good choice. The black detailing has a very good "narrowing" effect. 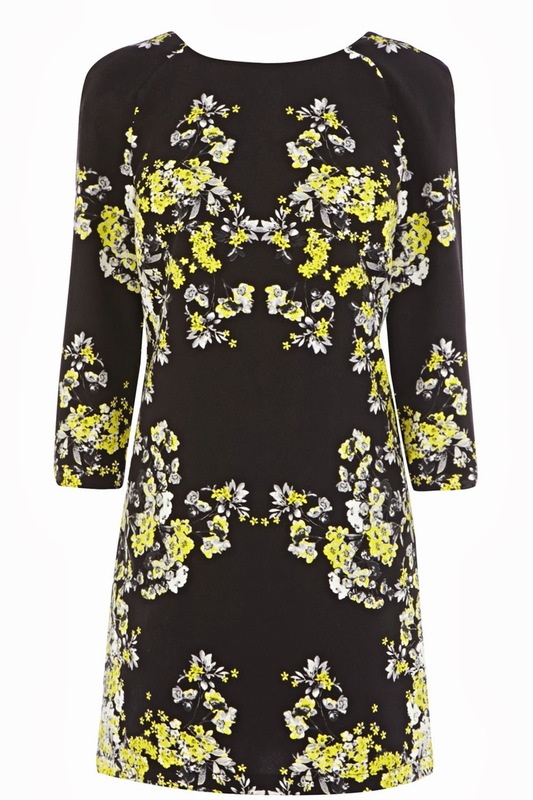 For anyone who likes the idea of a yellow printed dress, this blossom print dress (£60) is slightly more subtle than the one I am wearing. A dark background with a lighter print is also really flattering, so that's always something to bear in mind when on the hunt for printed clothing. 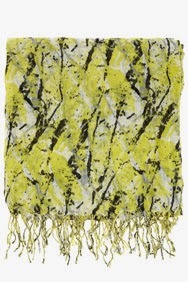 And just so that you know, the yellow printed dress also comes in a scarf. I'm detecting a hint of jumping on the Whistles bandwagon! Hopefully these suggestions will help anyone who is on the hunt for a new dress (to be worn either with or without make-up/tights). Have a lovely weekend! I've been watching Sophia Webster for a while now and I love her shoes more and more. I've never been one to hanker after a pair of Jimmy Choos, or Louboutins, but her shoes I get quite excited about. They have such a distinctive look all of their own and I'd quite like to have a few pairs to display on a shelf. If you haven't taken a look already, I've included a link to the Sophia Webster site just so that you can see what you think. 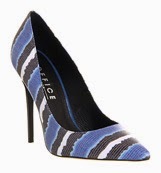 These Sophia Webster pale lime yellow and navy striped Lola pumps (£230) are a real favourite of mine. Fortunately, unlike lots of her other designs, they're not so distinctive that there isn't an alternative out there - which means that (at least in my dreams) I can have one "look alike" pair (which are also leather, unlike the SW ones which are canvas) whilst saving for one "real" pair. I've had my knives out tonight! Tomorrow our eldest daughter is 15 and I have made mars bar krispie cake for her to take to school for her friends. The trouble is, I didn't think that it was right that she should have to take it in with uneven edges so, whilst cutting it up, I just had keep levelling it off (as you do) so that it was straight. Inevitably this led to a lot of "off-cuts" which....I ate. Yum! I must admit to feeling a bit full right now though. I know that some of you wanted a peek at my new Kate Spade bag as part of an outfit, so here it is on its first outing. Today I had a meeting about an event that I have in February, so I decided to take it along with me. I really like the design of the bag as everything stays upright in it, unlike some other bags I have where everything slips down and ends up at the bottom - a bit like a drunk person sliding down a wall. I kept the rest of the outfit simple with navy Whistles trousers, a navy Whistles sparkly jumper, a pea coat from Reiss, a printed Whistles scarf and Zara boots. I couldn't quite face a dress - it was just too cold today! A few lovely bits and bobs available in the shops ...and an invitation! Up until now, despite my promise, I haven't managed to get around to bringing you the photos of some of the pieces that I took along to an event last Saturday. So today, I'm going to whizz through them. There's no time for links I am afraid but they are all still available in store - although of course sizes will be limited. Some pieces are actually new season so they should be in plentiful supply. This top from French Connection is one of their new season prints. There will be a lot of pastels around for s/s '14 but the addition of black to the mint green will, I think, make it more appealing to those who don't like the idea of a top which is entirely made up of pastel colours. 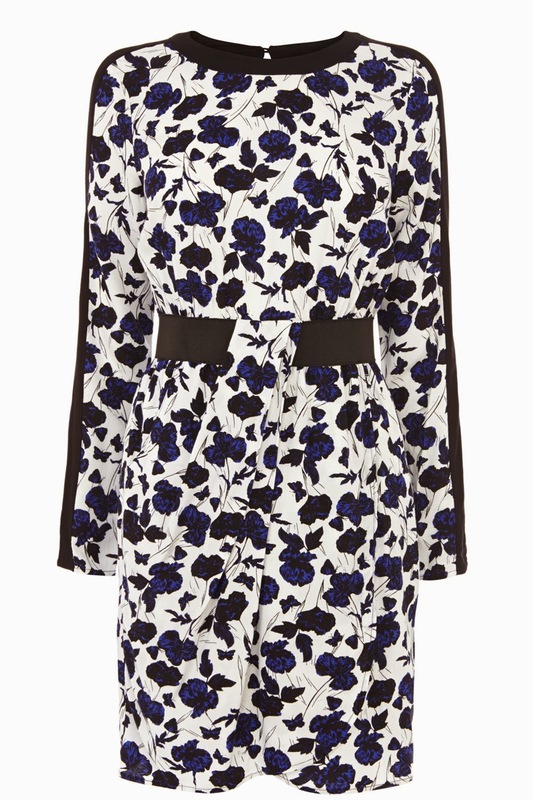 Another new season print, this time from Whistles. 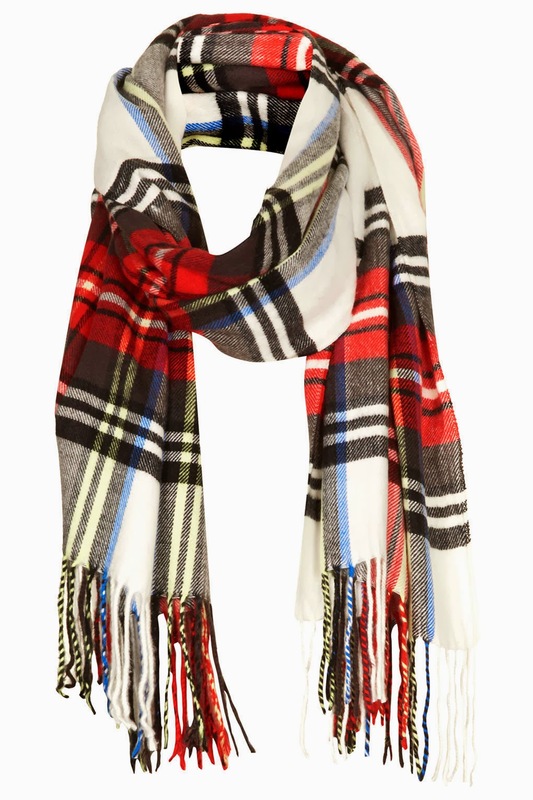 As is quite often the way with Whistles, they also do the print in a scarf, which is a good way of wearing it in a way which is less expensive. It also means that you can wear it more often. There's a good length to this dress and the black panelling down the sides is really flattering - so definitely one worth investigating. For a sunny yellow colour, this new season jacket from French Connection adds a nice touch to black, navy or grey pieces. I have a feeling that there will be a lot of yellow/green pieces around in the shops soon. This coral dress from Coast is now in the sale, reduced massively to something like £35. It's a really flattering cut - not too fitted but not too voluminous either plus the sleeves are an added bonus for many. Both the fabric and the colour of this Ted Baker jacket are lovely. It's a stretchy supportive fabric and again, nice to wear with darker pieces and also the yellows that I mentioned. This is currently somewhere in the region of £62. This pretty pink blouse from Coast has been around for a while now and it too is hugely reduced in in the sale. The pretty collar detail is lovely and the vibrant pink certainly makes you look twice! You may recognise these from Ted Baker as they put the print on about 32 different pieces. However, given time I think that the slight "print overkill" will fade from people's memories! They would look great in the summer with a plain t-shirt and flat sandals. These have been reduced from (something like) £129 to £59. Ah, I love this jumper which I featured a long time ago now. It has been reduced from £99 to £50. Great colours for a dark winter's day and then on into the spring. These cotton animal print trousers are currently in the sale at French Connection. These too would be great come the slightly warmer weather, with something hot pink, turquoise, bright yellow or coral (see below) on the top half. This coral jumper from M&S is their new season stock. It's around the £65 mark which is good for cashmere. 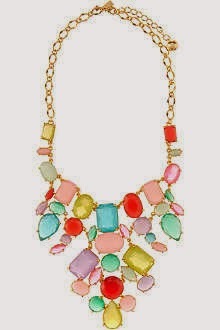 The necklace is in the sale at Coast for £19. Closer pic of the Coast necklace, which is lovely but just check that the stones are all secure. This is a current season M&S striped jumper. It's more oversized than the one above - so not for everyone - but I was totally taken in, not only by the stripes but also by the hint of pink (so predictable) which of course you can't actually see when it's on. Doh! Here I added a statement necklace from Topshop, which just gives the jumper a slightly different feel. More of a "jumper with a necklace" feel than "a jumper without a necklace" feel. Radical huh?! Here's the rail of clothes in its entirety - which was actually quite bright for a post Christmas event! Now, on to the next event! For anyone not on my email list/twitter/fb and who lives close enough to come, it would be fantastic to see you there. I am really looking forward to it - specifically to see what everyone else there (nutritionist, make-up artist, personal trainer, skincare specialist) has to say! Sorry for the fact that it's slightly oversized - no time to faff! Rugby matches and style. A contradiction in terms I wonder?! Anyway, as to the outfit - I wore Gap jeans, a Warehouse cable knit jumper, a French Connection scarf, a Primark fur gilet, the warmest overcoat that I own and which is from All Saints, M&S leather gloves and Cos (now very muddy) Chelsea boots, which our eldest held up this morning and said "I like these, they remind me of Harry Styles." For once I didn't quite know what to say! There's something very odd going on with the technology tonight, so I'm going to keep it short and sweet and get this posted before the whole lot crashes. 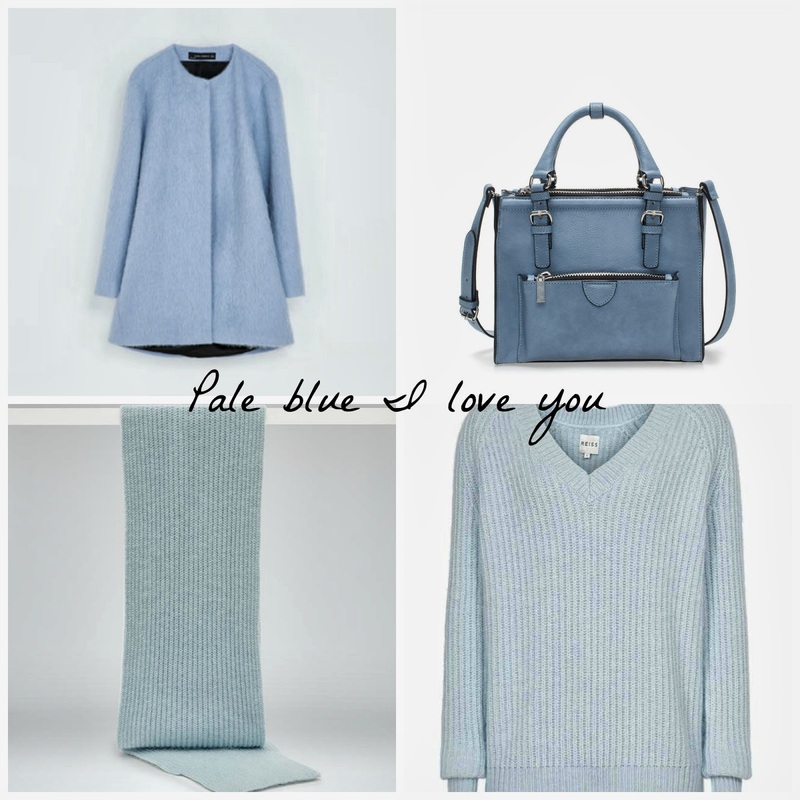 Today I wanted to write about pale blue. From the palest of baby blues (as in the colour, rather than weeping and realising that your life will never be the same once a baby has arrived) through to ice blue and cornflower blue, there's a shade for everyone and I am attracted to them all. I can't go past a pale blue handbag without stroking it and I'm a sucker for a pale blue jumper or scarf. The jumper that I am wearing above is one of my favourite Topshop ones. Its pale blue colour is great as it works so well with so many other colours. There's going to be a lot of pale blue around for S/S '14 so I thought that I would show you a few pieces which are currently available. Two are in the sale at Reiss, both of which I happened to stroke today. I'm sure that someone, somewhere, is going to ask me to leave a store really soon! Today just felt like the kind of day for a flared jean and some heels. I bought the jeans from Jaeger Boutique in the sale a couple of summers ago. They are high waisted and very supportive - in fact I used not to be able to wear them as they made me feel faint, which wasn't really very good at all. They are OK now though and having done a long run today, I felt the need for clothing which would hold me upright and which would prevent me from collapsing like a jelly on the floor. They did the trick up until 7.45pm and then I gave up on clothes in favour of my Onesie. Being of the chilly persuasion, I also wore a Cos chunky roll neck and my Primark fur gilet which is great for the school run and nipping in and out of the car. I find that if my torso is warm, I can cope without wearing sleeves and the lack of fuss and flapping of a longer coat is always welcome! These red patent Kurt Geiger shoes, which were also a sale purchase a while ago now, made a nice change to boots and their chunky heel works with a flared jean, more so than a thinner, more delicate heel - especially in the day time. As much as skinny jeans have a big role to play in my life, some days only a flared jean will do and there's no denying that their shape definitely makes you feel more elegant and elongated. I suspect that over the next few seasons we're going to see more of them making an appearance so get ready for them....the bootcuts will be back! For today's post I was going to show you the outfit that I have been wearing for the past two days but then I decided that "tax-return chic" was not a look that should be shared with anyone, anywhere, ever. It will be heading into its third day tomorrow and then I will finally see the back of it - the outfit and the tax return that is. Hopefully. I also thought that this was a nice cheery picture to share on a January night. When Mr SG said that he liked the idea of a new tea pot for Christmas, I was expecting him to identify something sleek, shiny and Alessi like - but what he had in mind was this Cath Kidston teapot. I've been trying for the last 19 years to break the bright green one that I bought at the same time as my first house but it's still going strong. I give this one - the one that we all actually like - a month! And I know that this makes me really sad but I am ridiculously excited about these new side tables from Ben de Lisi at Debenhams. You know when you just see something that catches your eye and you keep going back to have a look? Well that's what happened with these. They're in the corner of the kitchen with two armchairs and my favourite cushion made for my birthday by my school friend who blogs over at Lottie's Interiors. She has just moved house with her family and is in the process of giving it a major overhaul which includes knocking down walls. I know that she will work wonders with it so it's definitely worth nipping over and taking a look at her progress - something I hope to do really soon in real life. Wishing you all a very happy start to the week. The nights are definitely getting lighter. Yippee! Baukjen 2014 Spring Collection - First look! This season, the collection focuses upon a relaxed pared back feel – mixing a clean silhouette with textured fabrics and beautiful layers of colour. It's minimal, only slightly more refined. The soft colour palette of dusted blues and touches of metallic, with splashes of colour and abstract prints, reflect the mood of the collection. So, here are five style essentials to whet your appetite in preparation for the full collection - a white shirt, a leather jacket, a grey marl top, a grey marl dress and of course the ubiquitous boyfriend jeans (£95). What a great place to start. More will be revealed in due course! All rights reserved. All views and thoughts are my own. If not, I will attribute them accordingly. Theme images by Jason Morrow. Powered by Blogger.